Prepare the noodles according to packet instructions. Some just require soaking in boiling water for 5 minutes, others require cooking in a pot of boiling water for a few minutes. For fresh noodles, soak in boiled water in a bowl for a few minutes - do not boil in a pot. Drain when ready. Move the chicken and Chinese broccoli to one side and crack in the egg, and scramble it. Don't worry if some of it sticks to the wok, it will char as you continue cooking - you want that chargrilled flavour! Add the noodles, Chinese broccoli leaves and the sauce. Fold gently to combine, for the sauce to coat the noodles evenly and to caramelise, and the leaves to just wilt. They only need to be just wilted because they will continue to cook while you are plating up. 1. 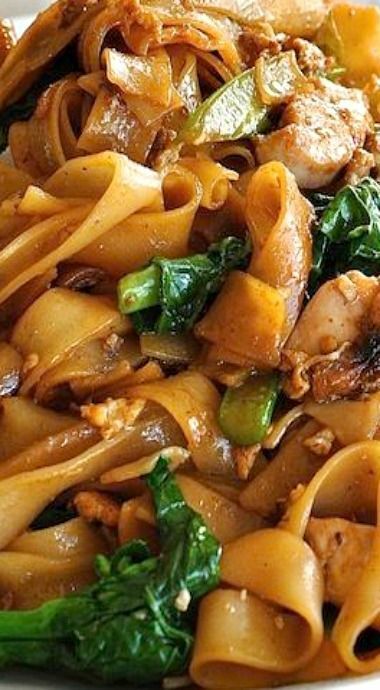 Pad See Ew is traditionally made with Sen Yai rice noodles which are wide, flat rice noodles. These are quite difficult to find, even at Asian grocery stores here in Sydney, Australia. The best substitute is to use wide rice stick noodles. I use Pad Thai, the widest you can find at supermarkets here. If you can find wide flat rice noodles, you will need over double the dried rice stick quantity which sounds like a lot I know, but the fresh noodles are really dense and heavy. Making this with fresh noodles really is fantastic, so keep an eye out for them! AUSTRALIA: Harris Farms now stocks wide flat rice noodles. 2. Dark soy sauce is thicker and slightly sweeter than normal soy sauce, and has a more complex flavour. It is available in Asian grocery stores and in the asian section of most large supermarkets. A great substitute is kecap manis which is an Indonesian sweet soy sauce. Otherwise, to make your own substitute, use 1 1/2 tbsp soy sauce with 1 tbsp honey instead of 2 tbsp sweet soy sauce. Normal soy sauce - I use Kikkoman. Look for a soy sauce bottle that does not say dark, light, sweet or salt reduced on it! 3. If you can't find Chinese broccoli, you can substitute with other leafy Chinese vegetables such as pak choy or bok choy. You can also add other vegetables if you wish. 4. You can substitute the chicken with other proteins suitable for stir frying, even tofu or prawns. 5. You can use other noodles if you want, fresh or dried, rice or egg noodles. However, I do not recommend using vermicelli as it is too thin for the strong flavours of the sauce. 6. If you accidentally add the noodles into the pan before checking they are properly rehydrated, simply add 1/2 cup of water to the pan and bring it boil, tossing the noodles to finish "cooking" them. It won't take long because rice noodles do not require much cooking - maybe 1 minute or so, and the dish will still come out fine (though if you already added the broccoli leaves then they will be very wilted rather than just slightly wilted). 7. Nutrition per serving, assuming 3 servings. 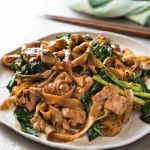 0 Response to "Thai Stir Fried Noodles (Pad See Ew)"